BRISTOL SHOW 2012: Wilson Benesch launches Square Three speakers | What Hi-Fi? Wilson Benesch is launching its latest, Square Three floorstanders here at the show, plus giving a tantilising glimpse at a new flagship Cardinal speaker due in September. The Square Three (pictured right) has a superior spec to the Square Two series, using a range of technologies from Wilson Benesch's higher-end Odyssey series. These include the company's Tactic Drive Units, plus carbon composite technology within the floorstanding cabinet designed to make the speaker more rigid for a more accurate sound. The 97.5cm-high Square Threes feature a 25mm soft-dome Wilson Benesch Spec. tweeter plus 7in Wilson Benesch Tactic Bass and Mid Drive Units. At the rear are Wilson Benesch's assisted bass radiators. 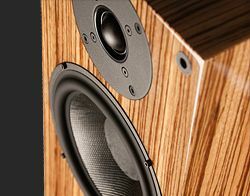 The speakers are available in a wide range of finishes, including piano-black, white, red tulip, red birds eye, birds eye maple, burr walnut, ebonised walnut, walnut, zebrano (pictured), natural cherry, maple and oak. The Wilson Benesch Square Three floorstanders are available now, priced £4450. We hope to review them shortly. Wilson Benesch is set to launch a new flagship speaker in September. The Cardinal, expected to cost £60,000 per pair, is shaping up to be an impressive beast, if the baffle shown here at the show is any indication. Hewn from a solid block of aluminium, the Cardinal's baffle (snapped below) promises a serious statement speaker. We'll bring you more details on the Wilson Benesch Cardinal in the lead up to that September launch. We'll also keep you updated with the company's plans for a new high-end turntable. No name or release date for that yet, but it will sit above the current Circle and Full Circle decks.